Everyone knows thyme. We cook with it when making sauces, stews, chicken etc. But did you know it is also super medicinal? It is frequently used as a tea for bronchial problems like acute bronchitis, whopping cough and laryngitis. An ounce of the herb is steeped in one pint of boiled water and then strained and sweetened with honey. It is also beneficial for diarrhea, chronic gastritis and lack of appetite. It is also useful as a mouthwash and helpful against fungal infections like athlete’s foot. A tincture of the fresh leaves capture the volatile oils best while a tea made from the fresh or dried leaves is also quite nice and effective. Thyme tea works well as a steam inhalation for a congested or stuffy nose and for colds. Simply make a tea with thyme, try adding sage and rosemary as well. These herbs are all antimicrobial so will help with any microbes or bacteria that may be causing sickness. Take the pot of hot tea off the stove and place your face over it, breathing in the warming and moving medicinal steam. Make sure to have a comfortable set up for this. Draping a hand towel over the back of your head to create more of an enclosed area may help. And take breaks as needed as you will get hot! 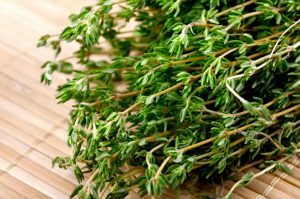 Thyme is one of the primer herbs for fall and winter cooking! Add to your soups, squashes, potatoes and chicken. Also makes a delicious addition to an edible infused oil or vinegar. To make an infused oil, add ingredients to oil (i.e. olive oil) and allow to sit for 2-4 weeks. If using fresh ingredient best to store in the refrigerator to avoid spoilage due to moisture content. Use on your salads, in cooking or as a dip for bread. Due to its antiseptic nature thyme makes a great surface cleaner spray for house cleaning. You can substitute the essential oils for a strong tea of any combination of these herbs. If using a tea trying 1 part quantity of the tea. Keep in mind that tea is not as shelf stable so either make smaller batches of this cleaner spray, store in the fridge or experiment with larger proportions of vinegar and lemon juice to help preserve. Thyme can also be made into a tincture, useful with onset of or during colds or as an antiseptic. Cautions/Contraindications: Do not use with hyperthyroidism.